Professional drywall installation services rely on a range of tools and processes to create a smooth finish for businesses and homeowners alike. The true value that drywall finishers create through their craft comes in the details. Companies that sign on with a qualified commercial drywall company can benefit from a complete field of quality. If you are looking for complete care from stud framing to wall painting and acoustical ceilings, AZ Drywall Finishing is here to meet your expectations in a professional and cost-effective manner. Our team of experienced drywall contractors in Chicago can deliver precision in our results for projects big and small! One aspect of note is the intense process of mudding to prepare your wall for the finishing steps. Joint compound is a versatile material that serves to eliminate all imperfections in your wall’s surface. Today, we’ll continue to discuss the variety of joint compound options by highlighting the value of ready-to-mix styles. When you are finished reading, be sure to contact us for a free estimate for your drywall installation project! Unlike pre-mixed compounds that rely on air to cure, powdered compounds rely on chemical reactions to create heat. Professionals rely on this option for a wide range of commercial applications. For many DIYers, setting-types are not practical because they set. Fast. This option is also more rigid, making sanding much more difficult. Minor errors can turn into exhaustive repairs if you aren’t careful! Differing dry times. Setting-type compounds are notorious for setting up before you’re finished, options are available. While you can find a fast-set product that dries in five minutes, we recommend seeking out 45- or 90-minute compounds for the best results. Faster results. Before another premixed coat can be added to your joints, the previous layer must dry completely. 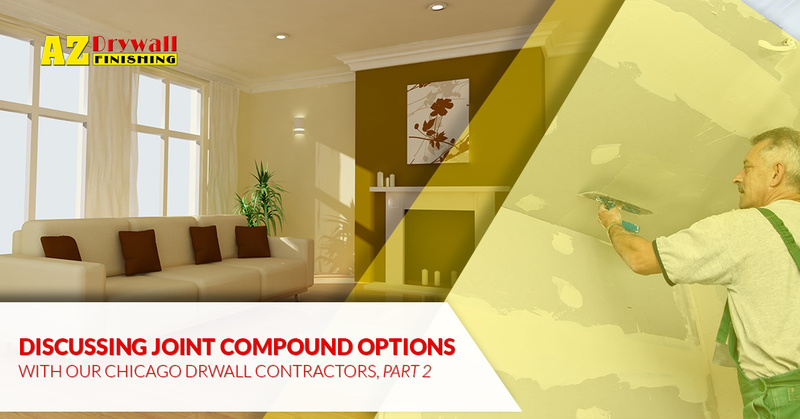 This joint compound results in faster finishes, as drywall installers have the ability to shorten their turnaround time by adding layers in a quicker succession. Stronger finishes. While sanding can be more difficult, the advantage is a wall that is better able to resist damages and abrasions. Contractors prefer the durability of this compound to reinforce the quality of their results. Advanced bonding. Your joint compound will need to have enough adhesive to stick to whatever surface it is applied to. Compounds that are not premixed will bond better to a variety of surfaces. Whether you’re making repairs, completing minor jobs, or working through major projects, hot-set compounds are a smart choice. Extra precautions need to be taken, though, as water and humidity can start the chemical reaction and ruin the rest of your compound! Which Compound Should I Choose? Temperature. Colder temperatures will result in improper drying, damaging the quality of your efforts. If you’re installing drywall, make sure the structure is above 55 degrees Fahrenheit. Humidity. The amount of moisture present in the area will slow your drying time, so be sure to check your hygrometer before starting! Airflow. Drying relies on the evaporation of moisture, which can easily be sped up if you can mitigate the humidity present in your building. Be sure to focus check that you are working with adequate ventilation. Based on your project and skill, different compounds will be ideal to provide the best results. Drywall finishers covering large areas will likely do better with a pre-mixed option while those hoping to complete a quick patch in a busy establishment can use hot-set compounds to complete same-day sanding and painting. Drywall installation seems deceptively straightforward, but the requirements of a quality finish create the need for skills, experience, and the right materials. If you’re in need of a commercial drywall company for your Illinois project, the team at AZ Drywall Finishing is here and ready to help. Our drywall contractors have delivered quality results to Chicagoland since 1999, and we’re confident that we can meet your goals in an honest and cost-effective manner. Contact us today to learn more about our drywall company!